Similar to the communities affected by the operations of Berau Coal (85% owned by Bumi plc), the communities living near the giant KPC mines in East Kalimantan, Indonesian Borneo, are opposing the takeover of their land. They are also facing violence and intimidation. 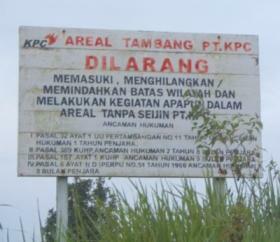 The social, environmental, human rights and health impacts of massive-scale open-cast mining are continuing to blight the lives of communities in Kalimantan, including the indigenous Dayak Basap Keraitan Segading, who face eviction from their homes for the third time to make way for KPC operations. This mega-mine is controlled by PT Bumi Resources, the Indonesian company which in turn is 29% owned by London-listed Bumi plc. It produces over 40 million tonnes of coal per year, which is exported mainly to markets in China and India. Villagers living near the mine have a long experience of forced evictions, livelihood loss, pollution, and company collusion with State security forces. At the end of 2012 a farmer was found lying covered in blood, after an attack by a person the victim identified as a company man. The local customary leader said the company had forbidden them from farming on land within the KPC concession. A plan to move the community to another village prepared by KPC is opposed by some community members who don’t want to have to start again from zero. The Indonesian Mining Advocacy Network (JATAM) is calling for a halt to the relocation plan and the return of the forests around the village to the community, forests which the community relies upon for their livelihood. They want KPC to stop all acts of violence against local people and to investigate the attack allegedly carried out by a company employee. They are urging all shareholders investing in this company to immediately withdraw their funding. Richard Solly, Co-ordinator of London Mining Network, said: "Bumi stands out among London-listed mining companies for the conflict and controversy that accompany it. But it also stands out for its appalling impacts on the ground. Investors should pull out of Bumi, and Bumi should pull out of Kalimantan."